The Spaceport welcomes its newest launcher: the medium-lift Soyuz, which clears the purpose-built installation on its historic first liftoff. Arianespace opened a new chapter in space history today with a milestone double mission success that marked the Soyuz launcher’s inaugural flight from French Guiana, and which placed Europe’s first two Galileo navigation satellites into orbit. Lifting off from the ELS launch site in the Spaceport’s northwestern sector, the Russian-built Soyuz performed a 3-hour 49-minute flight to inject its two Galileo In-Orbit Validation (IOV) spacecraft into a circular medium-Earth orbit. Transitioning from preliminary thrust level to its full thrust output while on the launch pad, the no. 1 Soyuz is seconds away from lifting off from French Guiana. 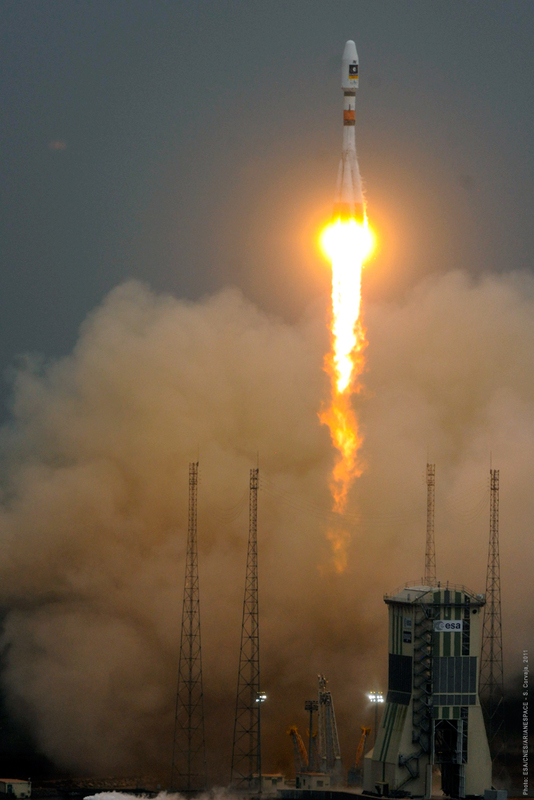 With today’s success, Soyuz enters Arianespace’s growing launcher family – providing a highly capable medium-lift vehicle operating at the Spaceport alongside the heavy-lift Ariane 5, and to be joined in 2012 by the lightweight Vega at French Guiana. Soyuz is one of the world’s most utilized launch vehicles, having literally ushered in the space age and performing manned/unmanned missions from its long-operating launch bases at Baikonur Cosmodrome in Kazakhstan, and Russia’s Plesetsk Cosmodrome. 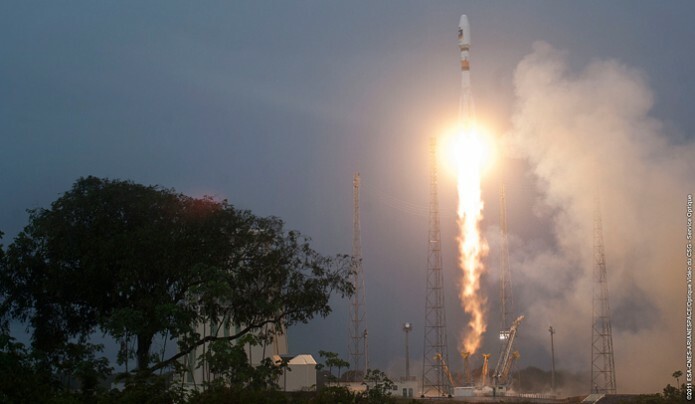 The maiden flight from its new “home” at the Spaceport marked Soyuz’ 1,777th launch, and began at exactly 07:30:26 a.m. local time in French Guiana – a precise moment of liftoff to enable the Galileo satellites’ injection into their proper orbital plane. – Semi major axis: 29,603.8 km. for a target of 29,600 km. – Inclination: 54.66 deg. for a target of 54.66 deg. Arianespace Chairman & CEO Jean-Yves Le Gall noted that Soyuz already has become a commercial success, with 14 firm payload contracts booked for missions with this medium-lift vehicle from the Spaceport – all signed prior to today’s inaugural flight. He recognized the determined efforts of those who advanced the Soyuz at French Guiana project from its first studies in the late 1990s to a successful introduction today – stating that the project’s key players are true space visionaries. “Bravo Europe…bravo Russia…bravo cooperation,” Le Gall added during comments made at the Spaceport’s Jupiter mission control center. The Soyuz is launched from a new site created within the Spaceport’s territory near the town of Sinnamary. Located 13 kilometers from the Ariane 5 launch complex, it is patterned after the existing Baikonur and Plesetsk Cosmodrome facilities, incorporating a massive multi-level concrete launch pad. A key difference is integration of payloads once Soyuz is raised to its vertical position on the launch pad, compared to the horizontal processing flow used in all steps of the vehicle’s assembly at the two Cosmodromes. Soyuz begins its ascent from French Guiana with the payload of two Galileo In-Orbit Validation (IOV) satellites. Compared to other Soyuz launchers, the version used by Arianespace at the Spaceport incorporates a new digital control system that increases flight authority during the launcher’s atmospheric ascent, and enables the use of an enlarged ST-type payload fairing for greater flexibility in accommodating spacecraft passengers. It also is equipped with the Fregat upper stage, which is designed as an autonomous orbital vehicle and has the capability to be restarted up to 20 times in flight – enabling complex payload deployment profiles to be performed. For today’s mission, the Soyuz was fueled inside a 52-meter-tall purpose-built mobile service gantry, which was rolled back from the pad one hour before liftoff. For its ascent, the launcher was powered by four first-stage boosters and its second-stage central core, followed by two burns of the Fregat upper stage that were conducted approximately 3 hours, 20 minutes apart. After deploying the two Galileo satellites, Fregat is to make two additional burns that will place the upper stage into a “graveyard” orbit. The Galileo payloads were carried on a dispenser developed for Arianespace that accommodates these spacecraft in a side-by-side arrangement. The satellites were deployed with the use of a pyrotechnic separation system that simultaneously released them in opposite directions. Europe’s Galileo network is being developed in a collaboration of the European Space Agency and European Union, with the goal of providing highly accurate, guaranteed global positioning services. The two In-Orbit Validation spacecraft lofted today were produced in an industrial consortium led by EADS Astrium with Thales Alenia Space, and will be joined by two more IOV platforms launched by Soyuz in 2012 – forming the operational nucleus of the full 30-satellite Galileo navigation constellation. 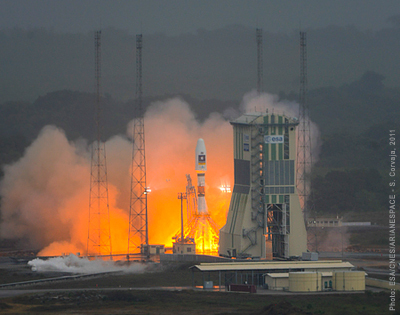 Arianespace has been entrusted to orbit all of the Galileo spacecraft, using both Soyuz and Ariane 5. After today’s success, Arianespace’s Le Gall announced the company’s next two flights, both of which are to be made with the workhorse Soyuz in December. A Baikonur Cosmodrome mission performed on Arianespace’s behalf by its Starsem affiliate will orbit the next batch of six Globalstar second-generation satellites; while no. 2 Soyuz flight from French Guiana is also set for the month of December, carrying a multi-passenger payload consisting of the French CNES space agency’s Pleiades optical Earth observation satellite, accompanied by four French Elisa micro-satellite demonstrators for defense-related electronic intelligence gathering (ELINT), as well as the Chilean SSOT (Sistema satelital de Observación de la Tierra) optical satellite for civilian and defense Earth observation. The sustained mission pace will continue in early 2012 with the Spaceport’s first flight of a lightweight Vega, as well as an Ariane 5 mission from French Guiana with the no. 3 Automated Transfer Vehicle (ATV) to be orbited for servicing of the International Space Station.